Striking modern architecture, coupled with elegant art nouveau buildings, and a wealth of Gothic and Renaissance monuments, make Valencia the perfect place to wander. Valencia is Spain’s third largest city and getting here is easy, with direct flights from London taking just over a couple of hours. Think of Barcelona without the crowds and a gastronomy that’s all its own. What makes it unique is the dry riverbed running through the centre of the city, a green artery running all the way to the sea. After serious flooding in the 1950’s, the river was diverted, the space was planted with trees and turned into a huge recreation area. 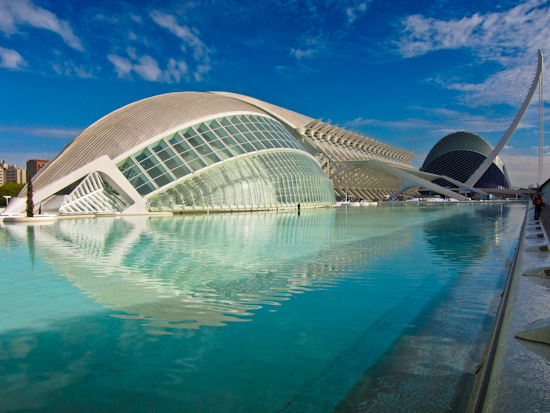 At the southern end is a cluster of impressive modern structures designed by Valencian architect Santiago Calatrava known as the City of Arts and Sciences. Fortunately they were all finished before the recession hit and I like the huge silo of the Museum of Sciences, particularly when it’s lit up at night. There’s also an Opera House, an IMAX Cinema and Oceanografic, the biggest aquarium in Europe. For an overview take a two hour guided ride with Valencia Bikes and enjoy the city’s new cycle lanes. The best way of seeing the old town is on foot. 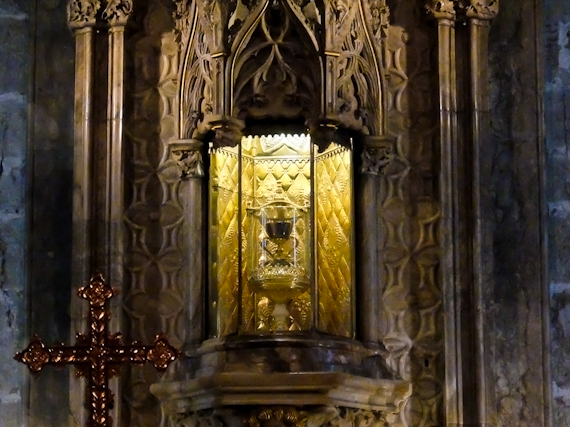 The Cathedral claims to have the top part of the Holy Grail, the cup that Jesus drank from at the Last Supper, and the Vatican agrees. 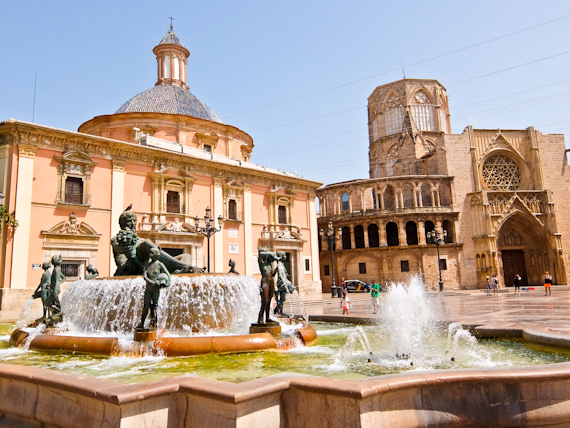 You can take a Holy Grail tour which starts with a visit to the San Juan del Hospital church, the oldest in Valencia, before continuing to the Saint Nicolas church. This was originally a mosque but the present Gothic structure dates from the 15th century. Its stunning 18th century Baroque frescoes have recently been restored, and you can see why it’s known as the “Sistine Chapel of Valencia”. 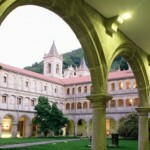 The newly opened Silk Museum, in the 15th century Higher Art College of Silk, details the history of silk manufacture in the city. 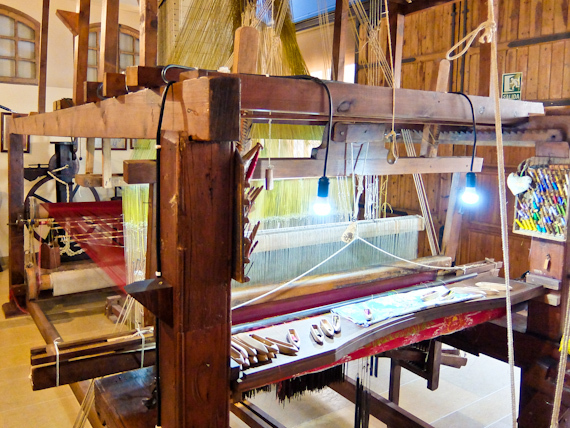 They’re still weaving silk fabric here on traditional looms, but there are also traditional Fallera costumes on display. Nearby, the Lonja de la Seda, the old Silk Exchange building, is a remarkable example of Gothic civil architecture, and has been declared a World Heritage site by UNESCO. 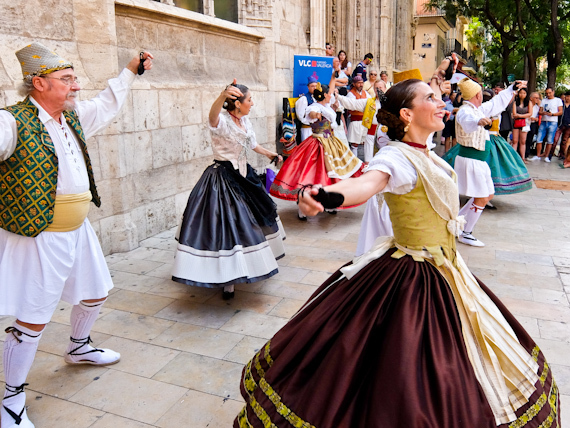 On the steps outside, every Saturday morning from 11 am, groups in traditional costumes perform regional dances, accompanied by traditional Valencian instruments. After two years of restoration, the privately financed cultural centre Bombas Gens is finally open. Originally an Art Deco engineering factory, they’ve preserved the underground shelter where workers gathered during bomb attacks in the Spanish civil war. More importantly, it’s a space for displaying thematic works from the foundation’s Per Amor a l’Art collection, and there’s a temporary exhibition by photographers Bleda y Rosa entitled “A Geography of Time”. Valencia is also famous for its street art and it’s worth taking a guided tour so you can distinguish the graffiti from the real thing. One of the most famous artists, Vinz Feel Free, has teamed up with photographer Txema Rodríguez, for an exhibition at the Centre del Carme, a converted medieval convent. Their exhibition “Joc”’ is composed of more than 100 huge photo montages on the theme of Pilota, the street handball game popular throughout the Valencia region. Vinz has painted bird heads on black and white photographs of naked players, depicting their passion for a sport that is played neither for money nor for fame. 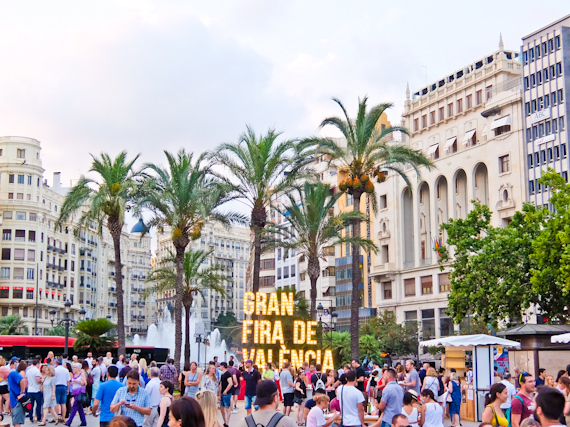 Every July, Valencia holds its traditional Gran Fira de València, the Great Valencia Fair, with a month of cultural activities. I get to attend an outdoor concert with violinist Ara Malikian mixing classical and rock music to a sold out crowd. Later there’s a spectacular fireworks display by the beach. Unfortunately, I’ve missed the Fallas Fiesta which happens in March, when enormous cardboard, wood, cork, plaster and papier-maché figures are filled with fireworks and set on fire. 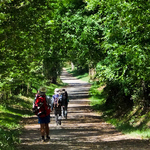 There is no way I can leave the city without a trip to the Albufera Natural Park, a pleasant morning’s cycle ride. It’s right next to the coast and contains the largest lake in Spain, with rare species of wading birds and a rich variety of wildlife. It’s also where you’ll find the rice fields, which supply the essential part of Valencia’s most iconic dish. Paella was invented here and I get to sample the real thing in one of the local restaurants in the tiny village of El Palmar. Forget about shrimp, sausage and fish, this was a dish for poor people, who used whatever came to hand. Usually that was chicken, rabbit and green beans and it doesn’t disappoint when the quality of the ingredients is so good. Valencia Tourism has information about the city. 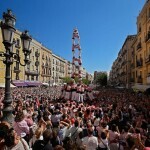 The Valencia Tourist Card offers free public transport and entry to museums and discounts on tours, restaurants etc. Hotel Sercotel Sorolla Palace makes a comfortable base. Goya Gallery Restaurant serves local dishes. Habitual by Ricard Camarena offers fine dining. Marina Beach Club, by the sea, is good for fish. 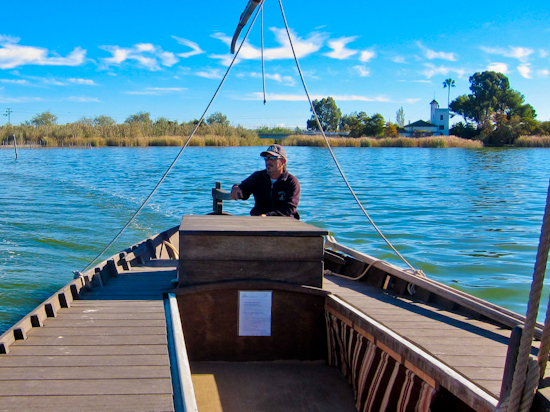 La Cigrona is good for traditional Paella, if you can’t make it to Albufera.